Installing motion sensor alarms is an easy and useful project. This way you can make the area surrounding your house safer and discourage intruders. The motion sensor alarm you choose will ultimately come down to your own needs. You have to take some time in order to get an exact idea on what you want from this security device. In order to make you decide easier on what motion sensor alarm is better suitable for your home, we made a list of the best devices in 2019. The solar powered MAXSA Innovations LED Security Spotlight is ideal for walkways, decks, garages and sheds. The motion activated sensor in this security alarm can detect motion up to 40 feet away. The device comes equipped with four super bright 0.5 watt LED lights providing 160 Lumens. 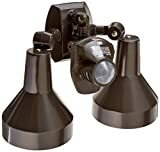 Users appreciate about this product it’s Dual adjustable light heads that allow them to secure at once two areas. The First Alert Motion Sensing Light Socket comes with the advantage of being very simple to install. Nearly any indoor fixture can be converted into a motion light with the help of this device. The First Alert is able to sense movement up to 12 feet, in a 360-degree radius. However, this motion sensor alarm can function only indoor. The Frostfire Bright LED is a powerful, yet unobtrusive sensor light. The 16 LED outdoor light is made of high impact plastic. heatproof, and waterproof. The device is solar powered and easy to install. The Sunforce LED Solar Motion Light allows users to program how long the light stays on, the level of darkness that activates the light, the range of motion detection and the sensitivity to motion. All the functions are powered by a solar panel. This decorative security light is stylish and offers an impressive 30-foot detection range. It comes with a 60-watt bulb and features a matte white or black finish. 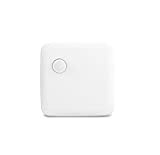 The motion sensor alarm comes with a wireless design that allows you to set up the detector almost anywhere. Its sensor is immune to pets that are weighing up to 40 pounds, preventing false alarms. The Samsung SmartThings is a smart motion sensor that can be easily integrated with other home automation devices. It comes with IFTTT technology and can be programmed to a range of actions, from turning on lights to sending a text alert. This is a durable outdoor alarm system that can come with a choice of one or more weatherproof motion sensor panels. The unit features a speaker and three chime options. The alarm can cover at once multiple areas since the device comes with multiple sensors. 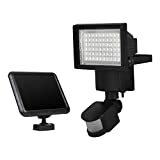 This device is one of the sturdiest available motion-activated floodlights. The system is industrial-grade and offers a 60-foot detection area. 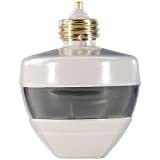 Its motion detector senses 360 degrees down and 180 degrees out. It also comes with secondary sensors that monitor below and behind the light. This rugged grade motion sensor alarm comes with a high power 1000 Lumen LED Flood Light. It provides a dimming feature in order to enhance security and conserves battery. However, you don’t need to worry about changing its batteries, since it’s solar powered.